Congratulations on your wedding and ceremony plans! Florida Gulf Beach Weddings provides beautiful and affordable Florida Destination Beach Wedding Packages for all beach locations in Pinellas County, Sarasota County, Manatee County and Tampa Bay. Choosing the right company can be time-consuming and exhausting, especially when you are booking online or 100’s of miles away. Let us take care of all the stressful organizing, so you can really enjoy your big day! Our team of Wedding Professionals can help with all of your wedding plans: Intimate Elopement, Vow-Renewal, Small Family Wedding or Second Marriage, Large Formal Weddings & Commitment Ceremonies. We have pre-designed our Florida Beach Wedding Packages to be All-Inclusive for all group sizes and budgets (2, 10, 20, 40, 50+). There are nine Beach Wedding Packages we currently offer not including the Proprietary Beach WeddingStudio option, with the flexibility to customize your choice of Flower Color, Chair Sash Color, Wedding Music (please save to a playlist on an iPhone, SmartPhone, iPad, iPod, etc), Ceremony Vows – Unity Sand & Blessing Stones, and much more. Launch of Tampa Bay Wedding Officiates Website. 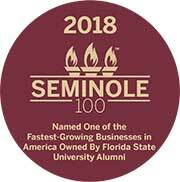 Continued Growth as ‘Officiate Services’ & Notary work in the Tampa Bay Market, particularly Hillsborough County. Partnerships with local venues: The Event Factory, Vinoy, Kapok Tree, Rusty Pelican, and the Intercontinental Hotel. In 2005, we spin off our Officiate Services Division into an independent company, Tampa Bay Wedding Officiates. Partnership is formed for Small Beach Weddings in Hillsborough & Pinellas County. Launch of ‘Gulf Beach Weddings’ as a website and Brand Marketing push. To create ‘Affordable, yet Elegant’ Beach Wedding Packages on Florida’s Gulf Coast. 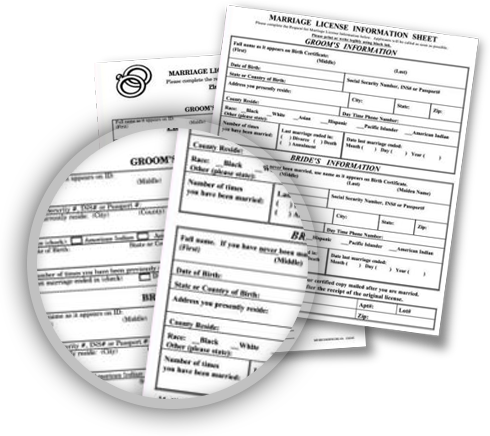 In 2008, we become a registered provider for the Marriage License by Mail program. Allowing us to obtain the Marriage License on behalf of the couple, prior to their arrival in Florida. Transformation of Company and focus on Beach Wedding Packages in the Tampa Bay Area. In 2011, Founder turns down CBRE offer to pursue Gulf Beach Weddings full-time. Expansion into Manatee & Sarasota Market (particularly Anna Maria Island, Lido Beach, and Siesta Key). Focus on Key Vendors & Training: Florists, Catering, Cakes, Photography, Videography and Live Musicians. Social Media blitz! Launch of New Gulf Beach Weddings Website. Further Branding, Refreshed Logo, Signage, and Focus in the Pinellas, Manatee, and Sarasota Markets. Member of Local Chambers to Promote Beach Tourism in the Area. Best and Brightest Year to Date. New Create Your Dream Wedding tool on the Website is launched - interactively choose your location and custom package options! 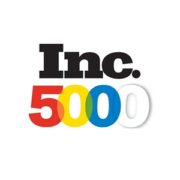 Grow to 30+ Employees & Vendors. Purchase of Property in Destin, FL off Main Street. 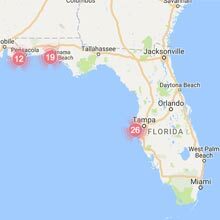 Let the permitting begin...as we tip toe into the Panhandle area to serve more clients and beaches! Named to 'Inc. 5000' and 'Seminole 100 List' for the first time...successfully service 7 of the Nations top 25 beaches! Completion of Destin Office/Warehouse Property - Spring 2019. Named to 'Inc. 5000' and 'Seminole 100' for 2nd time - successful multi-market Tampa-Destin beach locations to clients. At Florida Gulf Beach Weddings We Offer! 365 Availability: Midweek (Monday – Thursday) are always the best choice and you will find the beach far less crowded, making for a more romantic ceremony. At Florida Gulf Beach Weddings We Do Not! 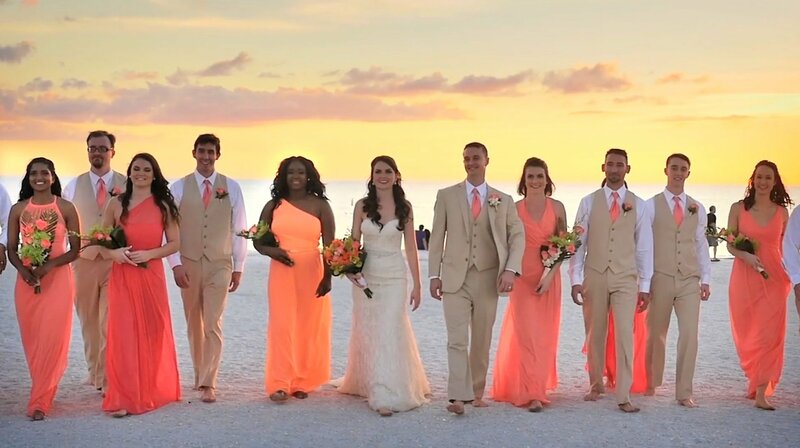 Since 2001, Florida Gulf Beach Weddings has officiated, photographed, coordinated, and organized 7,500+ Destination Weddings from Clearwater Beach to Siesta Key, Sarasota. A Full-Service Beach Wedding Company, we offer preferred Beach Locations, Wedding Vendors, and recommend Reception Locations based on your wedding size. Our Wedding Packages are All-Inclusive and designed to be simple and affordable, yet elegant. Just bring your Marriage License and Rings to the Ceremony – we take care of the rest! Our Beach Wedding Packages include: Wedding Ceremony Site, Bamboo Arch & Decorations, Gazebo Arch Upgrade, Chairs w/ Cover & Choice of Sash, Tiki Torches, Bridal Aisle, PA System with Recorded Wedding Music (Bluetooth Enabled), Photography, Video, Live Wedding Music, Professional Ceremony Officiant, Recording of Marriage License and Day-Of Coordinator. This also includes Setup, Beach Raking, Take Down and Cleanup. You may add any or all of these to our Wedding Packages: Barefoot Beach Shoe Basket, Sunset Champagne Toast, Rose Petal Aisle Way, Celebration Bubbles, Beach Tent Cake Cutting, Wedding Signs and much more…Please see our ‘About Us‘ page for more History & Mission Statement. The Tent reception may not be what you expect. Keep in mind: only certain locations allow this and additional fees apply for permits, tent rental and additional insurance. The cost varies depending on the size of the tent and location. Keep in mind, the local wildlife (birds) will be joining you and these areas are often the most crowded sections of beach.The best solution is to have the ceremony at a remote, more private location and the reception nearby (within 5-10 minute drive). Most of the guests coming into town for the ceremony will be renting a car regardless and can carpool. We do offer a 20ft. by 40ft. Masters Series – 3 point High-Top Tent which comfortably fits 50 Guests + Catering behind one of the Venue’s which allows ‘Permanent Tents.’ This is the ideal option should you decide to do so! This is arguably the best options since it has a built-in back up plan in case of inclement weather! Please Contact Us via email or call (727) 475-2272 for more options! Unfortunately, the deposit, plus any fees spent on your behalf for items to service your wedding are non refundable. They are paid to individuals and companies to reserve their date and time. This includes but is not limited to permits, flowers, cakes, supplies, outside deposits to specialty vendors. This applies to Photography, Videography, Live Musicians that are booked and cancelled months prior to the Wedding. Their deposit is forfeited as part of holding the date. Yes, of course! Feel free to add readings, prayers, poems to your liking. You may choose your own ceremony to include family and friends – this is often recommended during the ‘Unity Sand’ portion. Please provide us with a printable word document of your ceremony via email 2-weeks prior (we will make sure everything flows and sounds right)! This is a fun way to include family members, but also add personal vows to really make your Wedding Day unique! Unity sand, blessing stones, extra fees? There is absolutely no additional charge for any of these! Unity Sand or Blessing Stones are a fun addition and included with all of our Wedding Packages. Can our pets be include in the ceremony or wedding party? Technically No (as a rule of thumb). However, Yes at some locations. Please contact us or the Beach Municipality to confirm. Can we have singers and music during the ceremony? Yes – the PA System is included with all of our Wedding Packages. Please confirm ahead of time so we set out the appropriate Microphone and extension chord! Do you offer rehearsal services? If so, how much and when? This is typically done the afternoon the day prior or agreed upon time. Keep in mind the Beach Ceremony is often an informal event, so the rigors of a Traditional Ceremony are thrown to the Ocean. The cost for a rehearsal is an additional $125 for Pinellas County and $150 for Manatee/Sarasota Locations. May we use our own officiant? Yes, you may use your own officiant. Keep in mind our Officiates are familiar with The Order of Ceremony for our specific Company. This may differ should you decide to have a friend/family perform the same. If you use your own officiant we are not responsible for any aspect of the ceremony, guest control, signs or marriage license information. We have a number of professionals who have been doing Wedding Ceremonies for Decades. Many are former Pastors, Non-Denominational Ministers, Notary’s, and Rabbi’s. Please inquire should you have any further questions! Do the Rabbi and Priest charge the same fee as the notary and minister? Rabbi’s and Priests have a different fee structure than what is included with our packages. Based on availability, the fee for the Rabbi and Priest is to be discussed and paid direct. Often, many Priests do charge significantly more than your Pastor/Non-Denominational minister ($350-1,500 just to give you an idea on pricing). We do have 1 priest on-staff who is a retired reverend that can be requested – please Contact Us for availability. Do you offer a premarital course? Historically, we did offer the Pre-Marital Course however, this is no-longer required in the State of Florida. Outside vendors and direct booking? We have a number of Outside Vendors (Photographers, Videographers, Live Musician, etc.) that are all Professional and wonderful to work with. You are more than welcome to use your own Vendors as you see fit – keep in mind we are not responsible for any service provided for outside vendors, booked or paid for direct. We are registered providers for Marriage License by Mail for out of state and international residents. We also offer Online Premarital Course for Florida Residents. *Note you may apply for a marriage license online, however you MUST still go in person to obtain it. Be sure to read all the rules. I would like to say my experience with Gulf beach Weddings was amazing, they went above and beyond to accommodate to my smilingly unorganized event. Even after being two hours late they worked with me and still manage to make my wedding a memorable event in a positive way. Their staff was professional and friendly and very accommodating. It's not true what they say you really can get great service for a good price. My wife and i thank you from the bottom of our hearts, keep being AWESOME!!! Beautiful setup and excellent customer service! From beginning to finish working with Gulf Beach Weddings was a breeze. They gave me a perfect location with a stunning setup. The 2 gentlemen that were onsite were absolutely great! We had an issues at the beach with a home resident that tried to call the cops over my 10 year old lab being there for 25mins but they took care of everything and assured me that nothing would ruin my special day (even a rich old grumpy animal hater lol). Nothing but positive comments from guest, friends and family! Beautiful all around. Highly recommend!